Dedicated to the many loved ones who lost their lives & those injured on September 11, 2001, as well as the First Responders who died attempting to assist, at the World Trade Center, New York City, at the Pentagon, VA, & in the field of Shanksville, PA. This is also dedicated to those who escaped on that horrifying day & those who assisted others along the path of their escape. And now we add to this dedication those who lost their lives & those injured at the Boston Marathon, April 15, 2013, & the brave who assisted them. 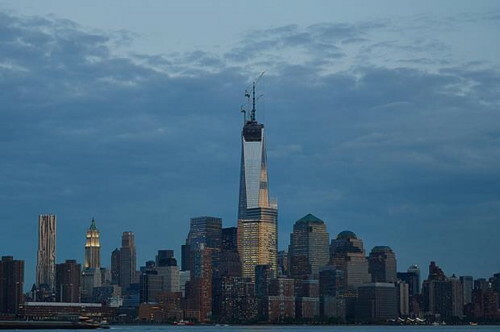 One World Trade Center, New York City’s Freedom Tower, as it appeared April 2013. Now complete with its spire, it reaches 1,766 feet high at a cost of $3.8 It is the tallest building in the western hemisphere and the third-tallest building in the world. The all too familiar World Trade Center, Towers 1 & 2, September 11, 2001, as they smoldered following the two terrorist attacks by airplanes just prior to collapse. Our last 12 years since September 11, 2001 have been quite different, to put it mildly. On September 14, 2001, Congress passed legislation called “Authorization for Use of Military Force Against Terrorists,” authorizing President George W. Bush to take whatever actions were required to protect our country. The saga of those twelve years which followed are known too well to all of us older folks and, sadly, to the children who have had to grow up under this long shadow. The purpose here is not to relate the events of these past 12 years, nor all the issues arising thereof, but to reflect, to comment on what strikes me in need of saying, and give you an opportunity to do the same and speak out under “Comments” at the end here. 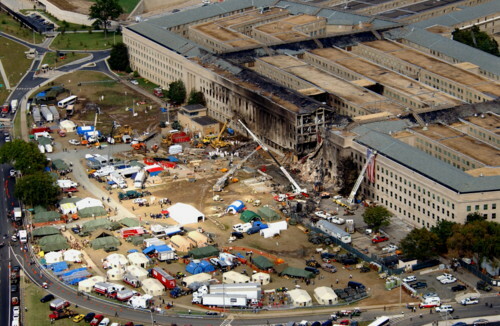 The third airplane’s destructive hit to the Pentagon, Arlington County, Virginia. What hits me in the face is how New York City and Washington, D.C. have been The Targets of those who wish to inflict harm upon America. And at this time with heavy hearts we must add Boston to the list. Perhaps our elders had it right in the 1950’s. Some of us grew up as school children living in proximity to New York City and remember conducting air aid/nuclear attack drills by hiding under our classroom desks or sitting on the hallway floor along the wall. These cities seem to be a microcosm of our American affluence/prosperity/power in the minds of terrorists, thus the targets of their hatred. My impression is that the focus of terrorists on these metropolitan areas has not lessened but increased during these past 12 years. The irony is that many of us realize the potential havoc an attack on a shopping mall in the suburbs, for example, would have across America. I hope the latest terrorist explosions at the Boston Marathon were not such an attempt and do not have that affect. 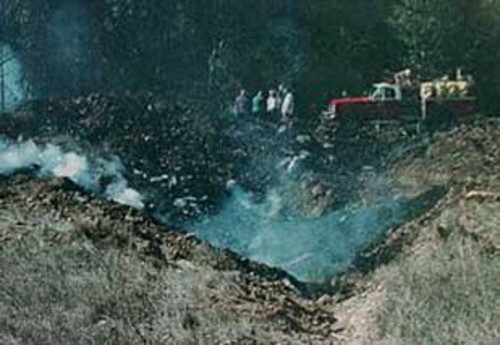 The crash site of the fourth aircraft, United Airlines Flight 93, near Shanksville, PA, where the passenger heroes downed the aircraft & possibly prevented greater tragedy to the Capitol building or the White House. Next, I think of all the efforts and money that have been put forth and spent in the name of “Homeland Security.” I vividly remember when our country struggled awkwardly to use the word “Homeland” itself at first. It reminded people of the German word, “Heimatland,” referring to “home” as in a place or nation that is home, “the Fatherland,” if you will. As Americans our sentiments are tied more to our democratic ideals than our geographic land mass. “American Security” just did not seem enough at the time, so “Homeland Security” it was and will probably remain with us. 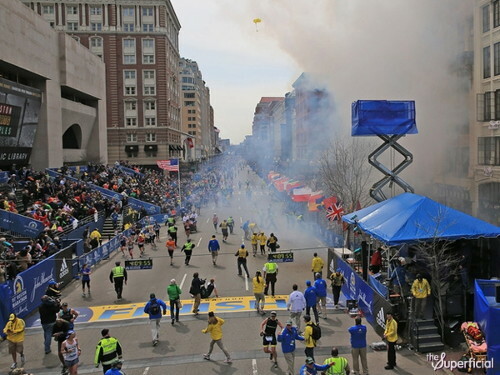 And now the terrorist explosions on April 15, 2013 at the Boston Marathon will most likely go down as the next chapter as we confront terrorism. In any case, we moved forward with Homeland Security measures. At first there was quite a bit of administrative reshuffling of agencies. And, perhaps, the measures were a bit “hit and miss,” especially in the area of air traffic security. But by and large, until the April 15 explosions at the Boston Marathon, Homeland Security efforts have worked effectively to circumvent and prevent terrorist attacks and keep us safe as a nation. The challenge now after Boston is to reexamine our security precautions in “the public squares” across America. When the Homeland Security program began, money was thrown at States and municipalities which struggled to spend on ordinary items in some instances, even fire trucks. But we have learned to appreciate and depend on our local first responders who are there for us well before the Federal government. Now I would like to see more defensive measures intensified at municipal levels, and at ports, for railroads, at chemical plants, electric and nuclear plants, and the like. 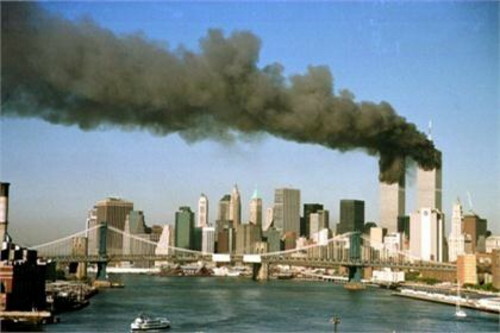 The United States’ prompt actions in Afghanistan, October 7, 2001, were overwhelmingly justified and smartly executed to destroy Al-Qaeda headquarters and training camps along with the Taliban government harboring them. After our initial success and elimination of the imminent danger to the U.S., I can’t help but wonder if the precedents of every president from Eisenhower to Clinton, with the exception of Lyndon Johnson in Vietnam, would have been a better approach. If you look back at those administrations, you see a pattern of limited military actions executed with surgical precision and dependence on military force deployed by air, be it bombing or no fly zones. And if necessary, the U.S. could have moved “in and out” again on the ground to eliminate any further threats. We did so May 2, 2011 to eliminate Osama bin Laden in Pakistan next door. Such an approach would have reduced the 2,200 U.S. soldiers killed and 17,674 wounded and over $600 billion expended thus far. The loss of Afghan lives is estimated at 132,000 and counting. Regarding the Iraq War, I ponder the many, many alternatives the United States could have used to remove Saddam Hussein from power instead of a preemptive invasion. – – Think CIA, air power, etc. 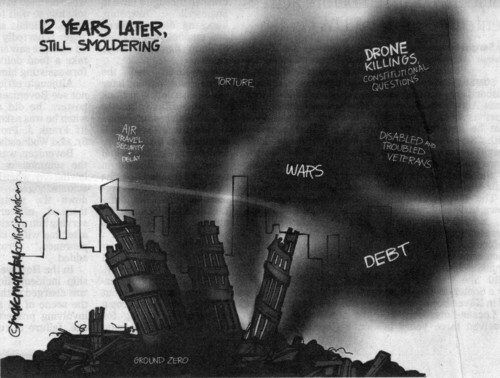 Likewise, the search for WMD could have been accomplished surreptitiously rather than, “We’re here and the WMD are not!” Instead, 4,486 U.S. soldiers killed and 32,021 wounded and over $800 billion expended. The toll of Iraqi lives is estimated at somewhere between 150,000 and 300,000…….and the killing there still goes on. Then there are the plethora of legal, Constitutional matters that have arisen since September 11 over these past 12 years: violations of people’s Constitutional rights as a result of the Patriot Act and its successor Act, acts of torture condoned at the highest levels of our government, existence and operation of the prison facility at Guantanamo, the rights of prisoners and tribunals vs. trial by our criminal justice system, the use of “blank sites” in foreign counties to hold prisoners indefinitely, atrocities such as Abu Graib, the use of drones, etc. While I have grave concerns regarding all the above, I am reassured by our American past. I have faith that we will work toward justice and getting it right in the end. I am referring to our American Civil War and the conduct and actions of President Lincoln as Commander in Chief to preserve the Union. His suspension of the writ of habeas corpus (the protection against arbitrary arrest and detention indefinitely without going to trial) and the use of military tribunals instead of the civil and criminal justice system were his most egregious acts. Just as we survived that dark chapter in our nation’s history, we will muddle through the legal questions thrust upon us by our fight against terrorism and right our wrongs and admit our faults in the end. Excuse us for living, struggling through these past 12 years. My last reflection is that of the terrible loss of the lives of the men and women serving in the military, those left maimed in the extreme to lesser injuries, and the vast commitment of resources and treasure expended. As mercenary as it sounds, all three are bound together in a recent estimate of 6 trillion dollars spent on the wars and that will be spent when all is said and done throughout the lives of the disabled Veterans until the end of their days on this earth. That is my most disconcerting reflection, the losses to our country in lives and resources that, but for the acts and threats of terrorism, could have been put to the productive purposes of our country. In these difficult economic times, after these 12 years, I reflect on what we had to do to fight terrorism, what we could have done better, and what we did not have to do at all. After 12 years we are overcoming terrorism. It is in that last point – – when we overreact – – that I regret to say when we do so, the terrorists become the victors. Comments: What are your reflections after these 12 years? What do YOU want to say? I believe that our entry into the Muslim world has been a disaster. Our leaders used a 19th century military approach to the problem. Of course this began with Bush H and continued with Bush W. The world will not be safe from societies that believe and practice 13th century religious tribal societies. This is evident in their treatment and general attitudes of women. No society can ever progress while trying to control and hold down half of it’s society. 300 years from now if the human race has managed to survive and not destroyed the planet. People read of this time in history and realize another religious war was waged on the world. Thank you for the article. Your clarity and kindness helps. This was very interesting to read. Such a disaster, I remember like it happened yesterday. And a great message that is! oh I knew that.. every time I write Santa he writes back, but if you want cookies.. you have to write to Mrs Claus …..just sayin’! Acting with imprudence on such similar “chatter” in the weeks prior to 9/11 likely allowed it to happen, with all the terrible consequences and repercussions mentioned in your excellent post. “no interest in how to land” … Incredible! That would not happen today, and again I personally believe the aggressiveness of the NSA just adds a significant, necessary layer to our diligence. M.
One of my followers has a extremely right-wing conspiracy Tea Party blog. According to her (yes, her! ), all of those events were staged……….Oh the laughter.